Two new polls issued this week — an Iowa poll from Monmouth University and a New Hampshire poll from St. Anselm College — found that Mayor Pete Buttigieg is polling 3rd in favorability behind 2 other 2020 candidates: former Vice President Joe Biden and Sen. Bernie Sanders. Why it matters: Iowa and New Hampshire will be the first two states to hold Democratic primaries, giving early insight into how the country will respond to candidates. 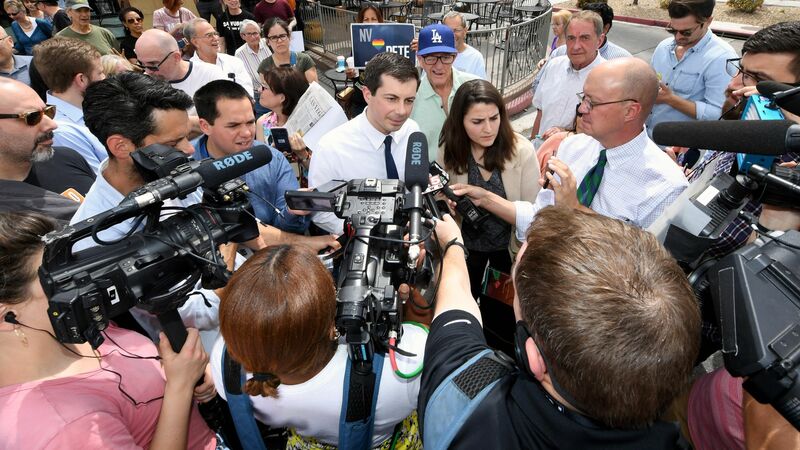 St. Anselm College found that Buttigieg has shown more growth than any other 2020 candidate since its February poll. He’s 3rd on the ballot test among New Hampshire voters at 11% and his name recognition has grown to 33%. Monmouth University found that Buttigieg "has one of the best positive to negative ratios in the field." His favorability rating falls at 9% after Biden's rate of 27% and Sanders, who stands at 16%. The big picture: It’s only April, a full year before the election and nothing is set in stone. But even still, it's a surprise that a small town mayor is polling 3rd in 2 key states behind candidates with more star power and name recognition.